Note: This article was originally published on InSpaceNews. At the hangar, the lights were off, but there was enough twilight to see the massive doors open. A tow vehicle pulled forth the pointed, sleek nose of an SR-71 Blackbird. The long arrow-shaped exterior, massive engines, and angled stabilizers were slowly revealed. The black titanium-composite skin seemed to absorb any remnants of the remaining light. SR-71 at Pima Air Museum in Tucson, Arizona. Photo by J. Thompson. 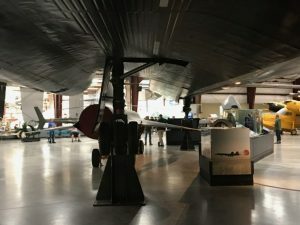 Although the SR-71 program didn’t officially end until 1998 for the Air Force and in 1999 for NASA—in 1990 the last operational Blackbird from the 1st Strategic Reconnaissance Squadron flew a retirement flight from Los Angeles to Washington, D.C. in a little over one hour. 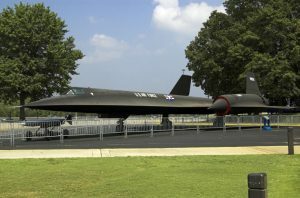 Today, it resides at the Smithsonian National Air and Space Museum’s Udvar-Hazy Center just off the south end of Dulles airport in Chantilly, Virginia. 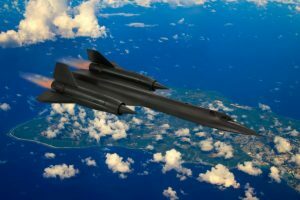 Since the advent of human flight, there have been incredible engineering milestones that vastly accelerated the aerospace industry—with the SR-71 Blackbird occupying a prominent place in history. What made the SR-71 so special was how incredibly advanced all facets of its engineering were at the time. It was first envisioned over 60 years ago to exceed 80,000 feet in altitude and fly at speeds greater than Mach 3. Eisenhower was still president when in 1957, Lockheed was approached by the Central Intelligence Agency to develop a spy plane that was nearly undetectable — and if it were to be detectable — it could still outrun any air defense system in the world. Think about this. Forty years prior, the U.S. military was using live pigeons with strapped-on cameras to gather aerial intelligence during World War I. Originally intended for the CIA, the government wanted a high-altitude, global-range reconnaissance jet that was fast enough to make an enemy surface-to-air missile look like a bottle rocket in comparison. Preceded by the highly successful U2 reconnaissance program, military leaders knew it was only a matter of time when enemy forces might be able to shoot down the slower spy plane. Their fears were realized when in 1960, Gary Powers was shot down in his U2 and captured by the Soviets. The U.S. was only two years away from testing the first A-12. So secretive was the program, it first flew at Groom Lake at Area 51 and became the origins of many UFO sightings around the desert southwest. Located in the high desert of Palmdale, California is the famed, Lockheed Martin Skunk Works site. Once an isolated area north of Los Angeles, Skunk Works was home to some of the leading minds and engineers in aerospace. 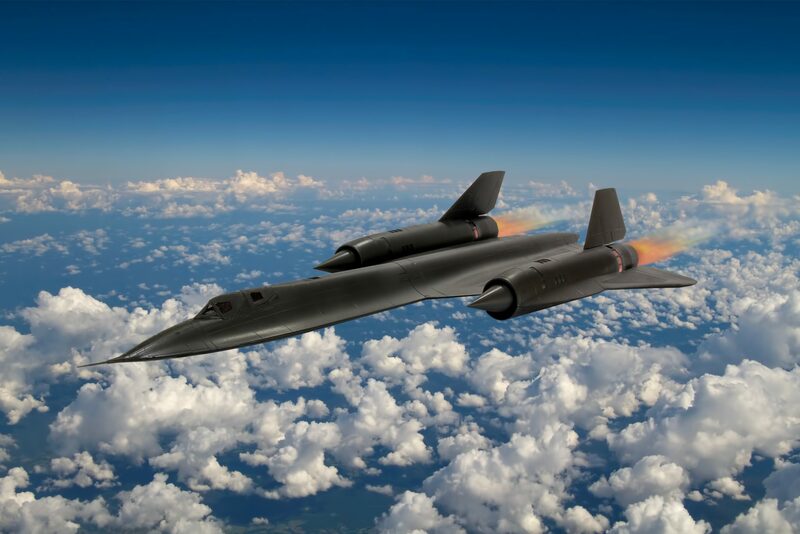 Having produced the U2 spy plane in secrecy, Skunk Works went on to create the SR-71 program essentially from scratch. 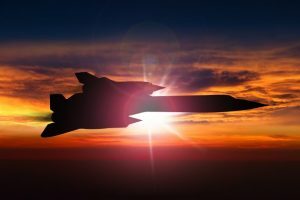 Each of the iterations in technology and testing informed next-generation of record-breaking aircraft including the F-117 Nighthawk, F-22 Raptor, and the F-35 Lightning. The Pratt & Whitney J58 engines produced over 32,000 lbs. of thrust. Special JP-7 fuel was required to operate at subfreezing stratospheric temperatures and during takeoff and landing in hot temperatures. It incorporated early stealth radar-avoidance design, which was later incorporated in the F-117 and B-2 stealth programs. 32 were built; 12 were lost. 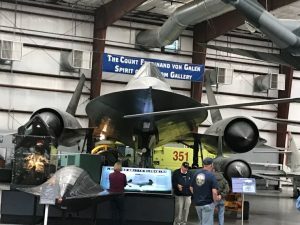 SR-71 at the Pima Air Museum in Tucson, AZ. Photo by J. Thompson. The pilots formed a tight-knit community. They were some of the Air Force’s top pilots—capable of flying a notoriously challenging aircraft and with incredible endurance, tucked into what essentially were full-pressure flight suits, which were needed to sustain the pilot and RSO flying in the upper reaches of the stratosphere. With a cockpit barely larger than the pilot, the SR-71 required high-character personnel who could maintain the covert nature of the missions. Sharing details of missions with friends and family were off limits. next Can We Stop Publicizing Terrorists without Censorship?